in situ Hybridization (ISH) is a powerful technique for detecting and localizing specific nucleic acid sequences within cells or tissues. This is achieved by the hybridization of a labeled probe to the specific RNA/DNA sequence within the cell and subsequent detection of the bound probe. ISH technique enables the semi-quantification of mRNA expression and helps determine the temporal and spatial patterns of gene expression in cells, tissue and whole animals. ISH technique can also be used for detection of intracellular pathogens with a very high degree of sensitivity. 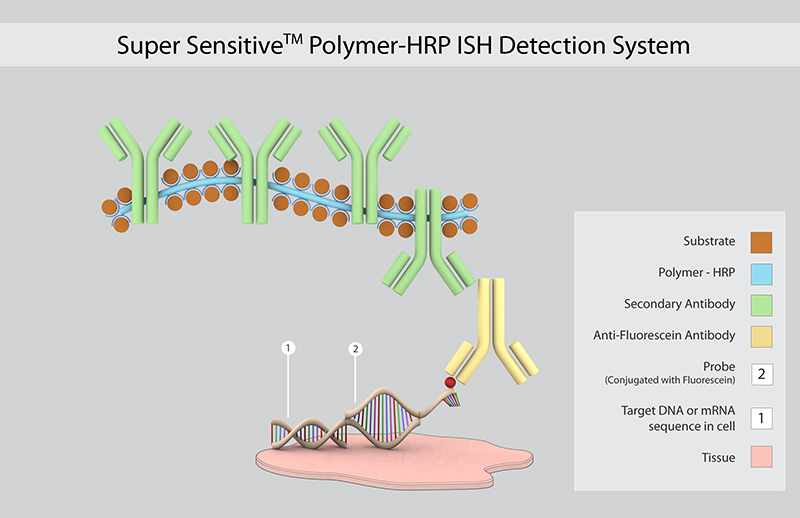 This is a novel detection system using a non-biotin polymeric technology that makes use of Poly-HRP reagent. As the system is not based on the Biotin-Avidin System, problems associated with endogenous biotin are completely eliminated. The technology allows excellent cell penetration ability for intense staining, compared with other polymer HRPs.